Mary Ann Gwinn, the book editor for the Seattle Times, warned me that the story she was writing about my book – Hidden Treasures: What Museums Can’t or Won’t Show You – was scheduled to run in the paper today, when everyone’s attention might be on the Seahawks Super Bowl win. So I was pleased the story actually showed up on-line Saturday, along with a slide-show of some of the treasures featured in the book and a mention of my February 12th appearance at Seattle’s University Bookstore ( 7 pm) – an official Humanities Washington event. “Everybody has something they just can’t find out enough about, even if they can’t explain why. For Harriet Baskas, that thing is museums. Not the mammoth, marble-lined kind (though those have their moments) but the museums of the backwaters, byways and small towns of America, the repositories of a community’s heritage. The word “heritage” is a big tent. We might be talking about John Dillinger’s gun (the Dayton History museum, Dayton, Ohio). Or a quilt pieced from Ku Klux Klan headgear, stitched together by a Puyallup housewife (Yakima Valley Museum, Yakima, Wash.). Or a pilot’s manual used by Orcas Island’s “Barefoot Bandit,” Colton Harris Moore (Orcas Island Historical Museum, Eastsound, Wash.) when he taught himself to fly. Or the gravestones of Perry Edward Smith and Richard Eugene Hickock, the killers of the Clutter family, made famous by Truman Capote’s book “In Cold Blood” (Kansas Museum of History, Topeka). 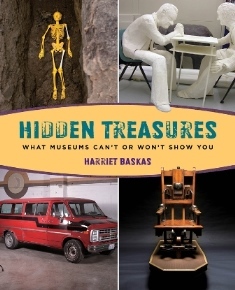 These are items that are considered too expensive, too dangerous, too charged with emotion or simply too weird for museums to exhibit, as Seattle author Baskas amply demonstrates in her new book, “Hidden Treasures: What Museums Can’t or Won’t Show You” (Globe Pequot Press, $19.95). “Most museums will say that they don’t show things because they are too fragile or they don’t have room. I was after all the other reasons,” says Baskas, author of six previous books on museums. Here’s a link the Q&A Gwinn put together from our chat. Aaron Britt, the senior editor over at Dwell Magazine has been reading Alain de Botton’s book, A Week at the Airport: A Heathrow Diary, and was pretty sure fans of Stuck at the Airport would be interested in his two-part review. He’s right. de Botton’s book is all about the time he spent as writer-in-residence at the British Airways terminal in London’s Heathrow Airport. If you haven’t got your own copy of the book yet, you can read an excerpt in the New York Times and then wing your way over to Britt’s review. My favorite bit comes when he gets to Richard Roger’s eye-goggling architecture itself. He lucidly declares that the building’s soaring supports “were endowed with a subcategory of beauty we might refer to as elegance, present whenever architecture has the mnodest not to draw attention to the difficulties it has surmounted. On top of their tapered necks, the columns balanced the 400-metre [sic] roof as if they were holding up a canopy made of linen, offering a metaphor for how we too might like to stand in relation to our burdens.” Nice stuff. I think that the second half, dominated by an assessment of what’s beyond the security gate is far more fruitful for de Botton. His natural position of informed ruminator gets going as he takes us on more of a guided tour of the security zone, shopping area, and first class lounge. He’s best when making connection between physical spaces and desire then when focusing on individual people. The space itself, and more importantly, our rituals in it show through better in the second half, the throat-clearing of the early pages now nicely laid to rest.